Crisis workers from a South Florida mental health facility were called in 2016 to hold alleged gunman Nikolas Cruz for a psychiatric evaluation after he sent out a Snapchat video in which he cut his arms and said he wanted to buy a gun, according to a mental health report. But after speaking with Cruz, Henderson Behavioral Health health professionals chose not to hospitalize him, according to a November 2016 Florida Department of Children and Families investigative report obtained by NBC News. The department officially released the report Tuesday after NBC News published details from it. 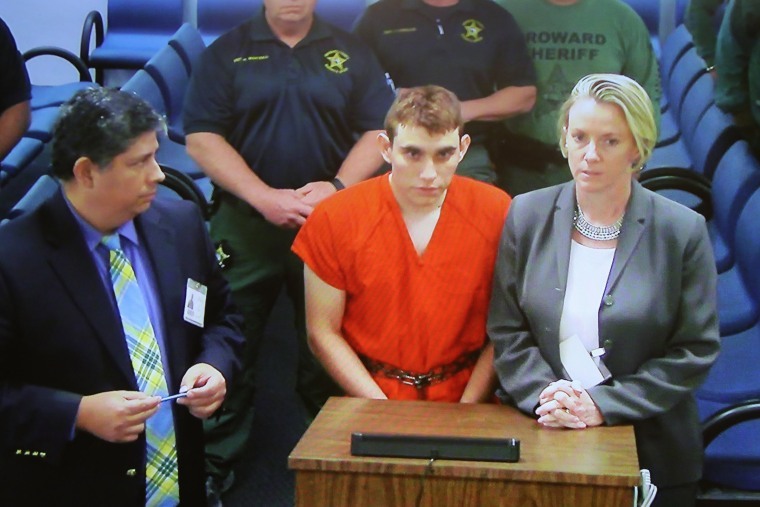 An individual had alerted Henderson Behavioral Health to come to Marjory Stoneman Douglas High School to evaluate Cruz for possible detainment under the Baker Act, which allows authorities to hold individuals against their will for up to 72 hours, according to the 2016 report. Those 17 and younger can be held for 12 hours. The Florida Department of Children and Families was alerted after Cruz sent out a Snapchat video in which he cut both of his arms and shared his intention "to go out and buy a gun," according to the report. The report noted that "Mr. Cruz has fresh cuts on both his arms" and that in 2015 he'd had a "Nazi symbol drawn on his book bag" and "hate signs on a book bag stating, 'I hate n-----s.'"
Cruz allegedly killed 17 students and staff members and injured more than a dozen others Wednesday in an attack on Marjory Stoneman Douglas High School, which he attended until he was expelled last year. Lynda Cruz, his adoptive mother who died from pneumonia in November 2017, told mental health investigators in 2016 that her son suffered from ADHD, depression and autism but insisted he received his necessary medication as prescribed, according to the report. She told investigators at the time that her son did not own a gun, beyond an air gun that she had taken away when he "didn't follow house rules about only shooting it within the backyard at the targets." Lynda Cruz told investigators that her son had started to cut himself after a breakup, the report said. She also "stated that there has never been any issues with other races or issues with racism in her family." Though there had been an account of medical neglect, the report said that "[Cruz's] clinician from Henderson mental health has stated that there are no issues with [Cruz's] medication and he has been compliant with taking his medication and keeps all of his appointments." A counselor at the school told the Florida Department of Children and Families investigators that a professional from the mental health facility had visited Cruz and "found him to be stable enough [to] not be hospitalized." The school counselor expressed concern with the department, according to the report, and said she and her staff wanted to "ensure that the assessment of Henderson was not premature." Nonetheless, the Florida Department of Children and Families investigation was "closed with no indicators to support the allegations of inadequate supervision or medical neglect." Henderson Behavioral Health did not respond to a request for comment. After his mother died, Cruz and his brother lived with a family friend. He later asked a school friend if he could live with him and his family. That friend's parents, James and Kimberly Snead, spoke about Cruz to the media for the first time on Saturday. "We had this monster living under our roof and we didn't know," Kimberly Snead told the Miami Herald. "We didn't see this side of him." "Everything everybody seems to know, we didn't know," James Snead said. "It's as simple as that." Cruz, 19, is now charged with 17 counts of premeditated murder. His court-appointed lawyer said that he would plead guilty to a sentence of life without parole. Less than six weeks prior to the shooting, the FBI also received a tip about Cruz but never followed up. "The system broke down," said Gordon Weekes, one of Broward County's chief assistant public defenders. "It did not catch the red flags … [and] it's changed the landscape of this community." CORRECTION (Feb, 18, 2018, 7:20 p.m. ET): A previous version of this article misstated the organization that had been alerted to Cruz's Snapchat video. The Florida Department of Children and Families was alerted, not Henderson Behavioral Health.